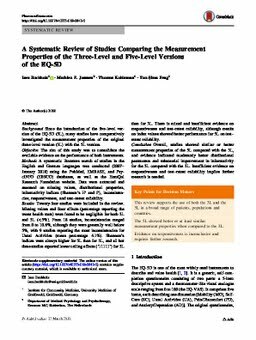 Background: Since the introduction of the five-level version of the EQ-5D (5L), many studies have comparatively investigated the measurement properties of the original three-level version (3L) with the 5L version. Objective: The aim of this study was to consolidate the available evidence on the performance of both instruments. Methods: A systematic literature search of studies in the English and German languages was conducted (2007–January 2018) using the PubMed, EMBASE, and PsycINFO (EBSCO) databases, as well as the EuroQol Research Foundation website. Data were extracted and assessed on missing values, distributional properties, informativity indices (Shannon’s H′ and J′), inconsistencies, responsiveness, and test–retest reliability. Results: Twenty-four studies were included in the review. Missing values and floor effects (percentage reporting the worst health state) were found to be negligible for both 3L and 5L (< 5%). From 18 studies, inconsistencies ranged from 0 to 10.6%, although they were generally well below 5%, with 9 studies reporting the most inconsistencies for Usual Activities (mean percentage 4.1%). Shannon’s indices were always higher for 5L than for 3L, and all but three studies reported lower ceiling effects (‘11111’) for 5L than for 3L. There is mixed and insufficient evidence on responsiveness and test–retest reliability, although results on index values showed better performance for 5L on test–retest reliability. Conclusion: Overall, studies showed similar or better measurement properties of the 5L compared with the 3L, and evidence indicated moderately better distributional parameters and substantial improvement in informativity for the 5L compared with the 3L. Insufficient evidence on responsiveness and test–retest reliability implies further research is needed.